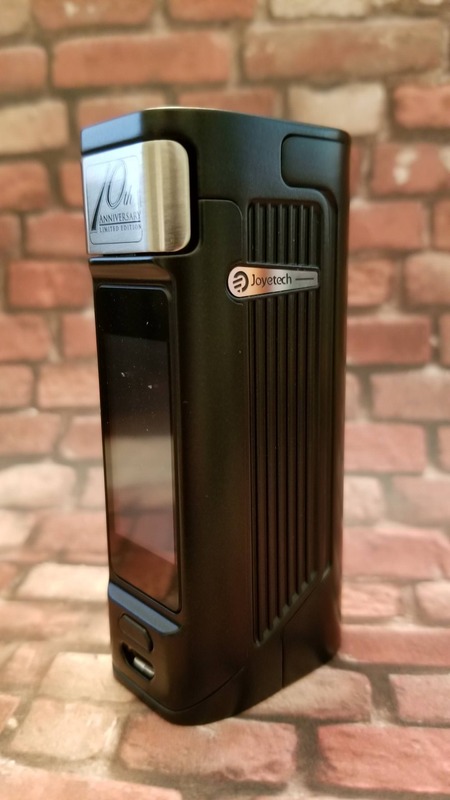 Joyetech Espion Solo with ProCore Air review by Mjag…21700 goodness? 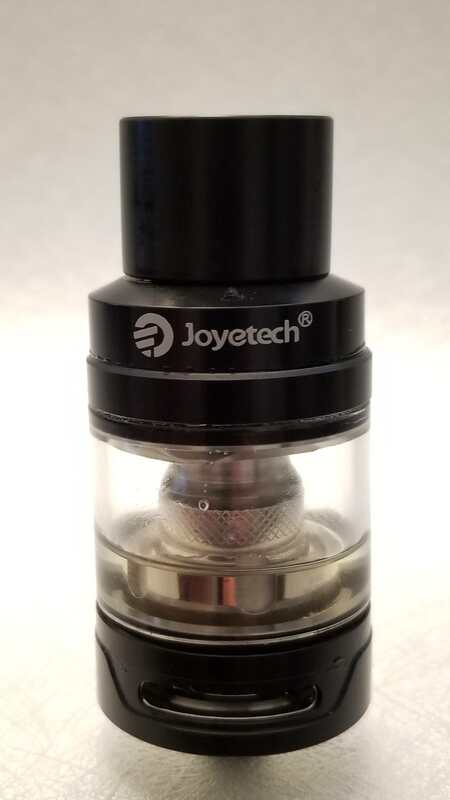 Thanks for taking the time to view my review of the Joyetech Espion Solo with ProCore Air kit which was sent to me directly from Joyetech for the purpose of this review. 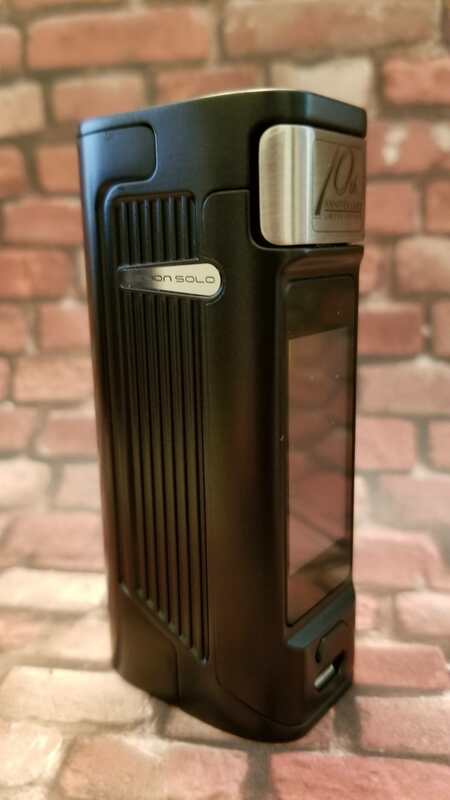 Right off the bat the new Espion Solo reminds me of a souped up eVic VTC Mini with the added benefit of 21700 compatibility. Nice all around small mod with an intuitive touchscreen that is both bright and easy to use. Nice form factor, just like the VTC Mini but the battery cover is now rounded which adds to this being a comfortable mod to hold. On my sample version which is sent out prior to production I did have a loose battery door, it didn’t fit right on top, had some push to it. I fixed that with a piece of electrical tape that kept the battery door all snugly wugly. 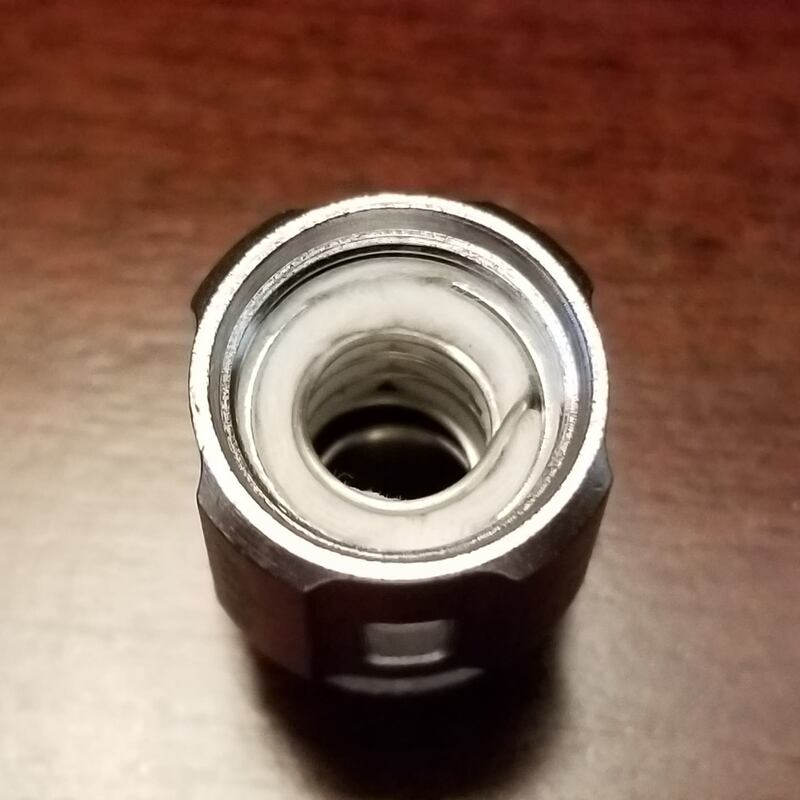 I can report that a friends Espion Solo did not have the same fit problem so it could be a production sample problem but it is easy enough to fix. The 510 on mine is a little raised and a bit crooked, not annoyingly so but it should be mentioned that some tanks will have a gap. It is not on all tanks but enough to deserve mention. Here is a pic showing the gap with the Procore Air tank it comes with in the kit. Fire and mode button have a nice click to them, more so with the mode button than the fire button but no complaints. The touchscreen takes a little getting use to as it is a little different than most but I found it intuitive after using it for a short time. The mode button is a really good idea, makes it easy to use and I feel the inclusion of it makes it easier to use than some of the other touchscreen mods I have. At first I did not know there was a screen protector on the screen, wasn’t until I poked the edges with some sharp tweezers that it came up. I found the touchscreen to be a little more responsive with the screen protector removed. I did have times where I had to hit the screen a few times to get a response, more so with the screen protector on. Some selections are smaller so those with big thumbs might find it aggravating but all in all it is a good touchscreen. A good tip if you wanted to turn the screen off is to click the mode button 3 times to turn off and 3 times to turn back on. It sometimes works with 2 clicks but not always, 3 clicks works for me everytime. After taking a puff the screen stays on for 30 seconds which eats away at battery life, turning it off will save you some vape time. Being 25.5mm wide means 25.5mm tanks will fit just right, here is the Ehpro Billow X which is 25.5mm at the base. 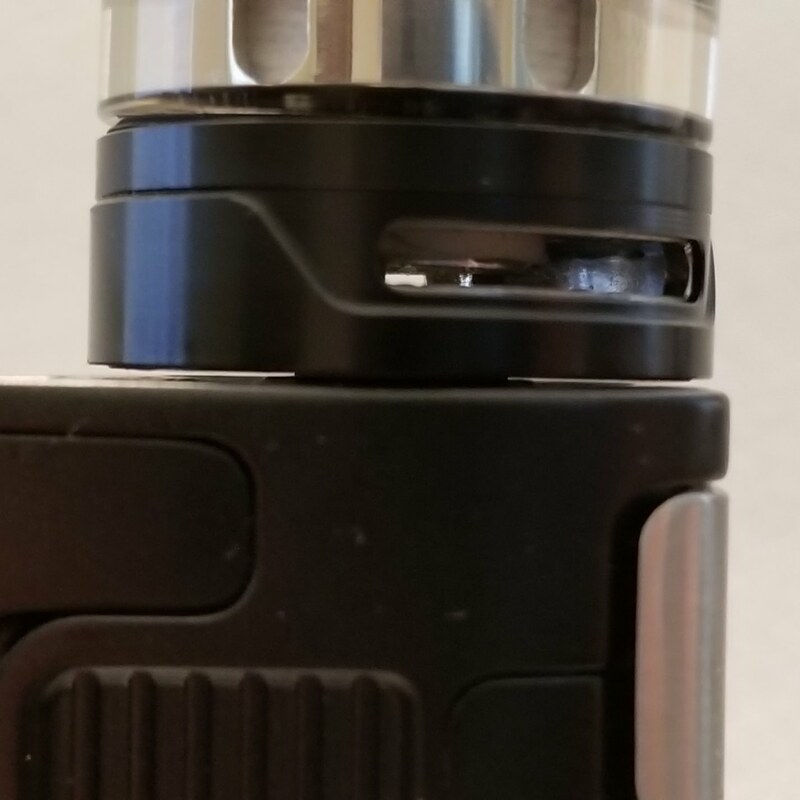 24mm tanks look good of course like the Geekvape Loop RDA but there is a very small gap. 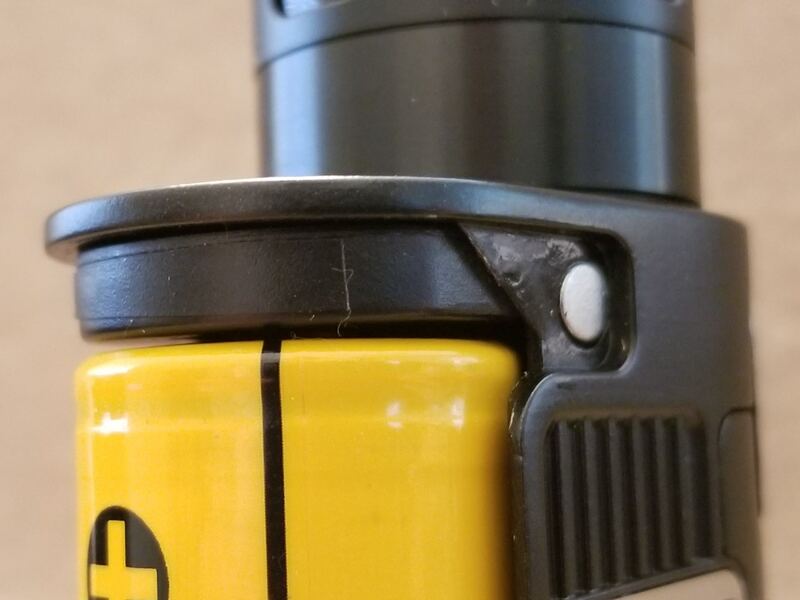 No battery strap but installing and removing the battery was never a real problem since there is space near the bottom to grab on to. Aside from the gap with some tanks and the battery door being loose which I remedied with a little electrical tape this is a solid little mod. I was going to take it apart but the screws at the bottom were not accessible without a long nose torx screwdriver which I do not have. I am not crazy about the 510 due to the gap it can leave but it would not wiggle on me when I yanked on it. Not much to complain about, it is capped at 80 watts which is lower than other single 21700 mods but is conservatively fair. It feels close to accurate, maybe a little off but without an oscilloscope I am just going off experience and comparing to a Sxmini G Class. Preheat is included but it is not a % based system so I normally avoid using those. I do love that it starts at 1.3 watts and increases by .1 watt increments until 20 watts then increases in 1 watt increments until 80 watts. It is a pet peeve of mine when mods only go in .1 watt increments, it is a waste of time IMO above 20 watts. 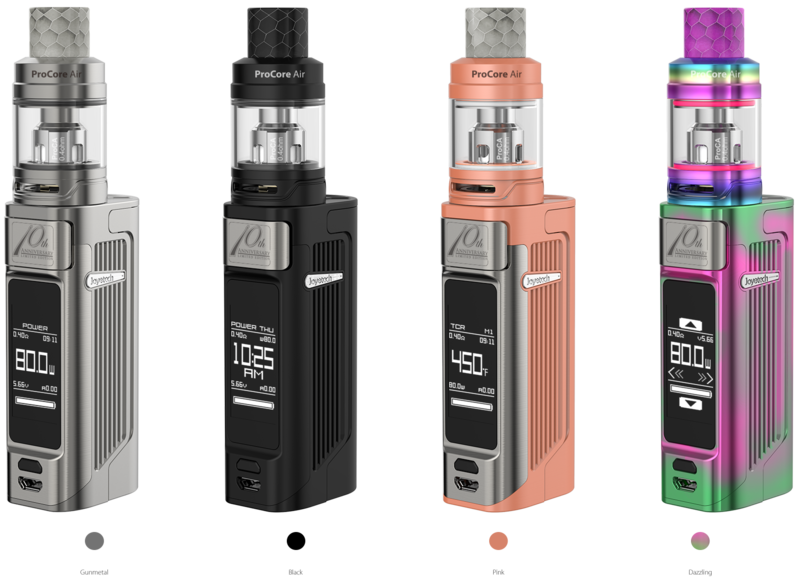 Joyetech doesn’t have a great rep when it comes to TC and the Espion Solo is no exception. I could get decent TC results at times but consistency is the problem. Sometimes I thought I had it going well but eventually it would change requiring further tweaking. Other times, like right now while writing this review it will drop me out of TC and into power mode at 20 watts. This was with a tank I had been using all day with a fresh build and the ohms locked. First 4 tanks no problem, 5th tank and now it doesn’t want to stay in TC mode. Even when it worked it could vary from time to time, great TC is about consistency and there it fails. TC also would vary depending on builds, it was usually always at least 10 to 20f hot but with some builds it was as much as 40f hot. That is actually something I can deal with, too hot just lower the temp. Dropping out of TC is beyond annoying though, just use this mod in power mode, skip TC. With the included Avatar Controls 21700 I must say battery life was pretty impressive. I measured 4186 mah with my Hohmtech Hohmbase charger. Mooch has rated the battery at 3900 mah and 20amp which is still pretty impressive. 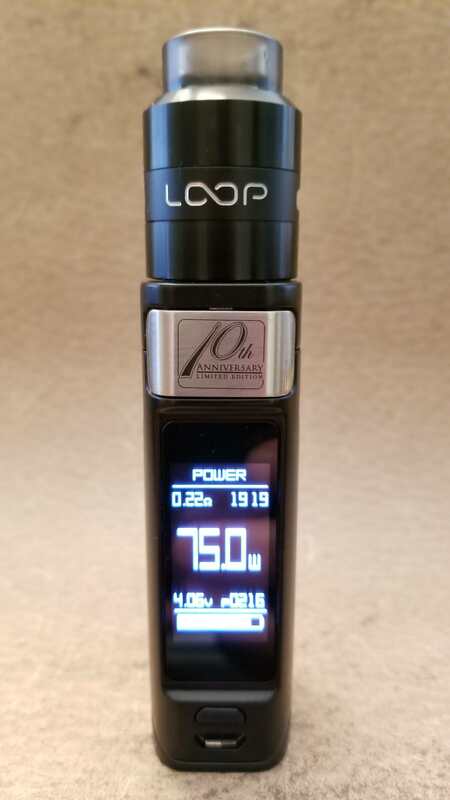 I was able to get 222 puffs at 65 watts using a 0.17 ohm build before the battery needed charging. That is actually pretty good for me as I take about 4 second draws. This is definitely a mod I have no problems taking with me on the road due to the size and battery life. 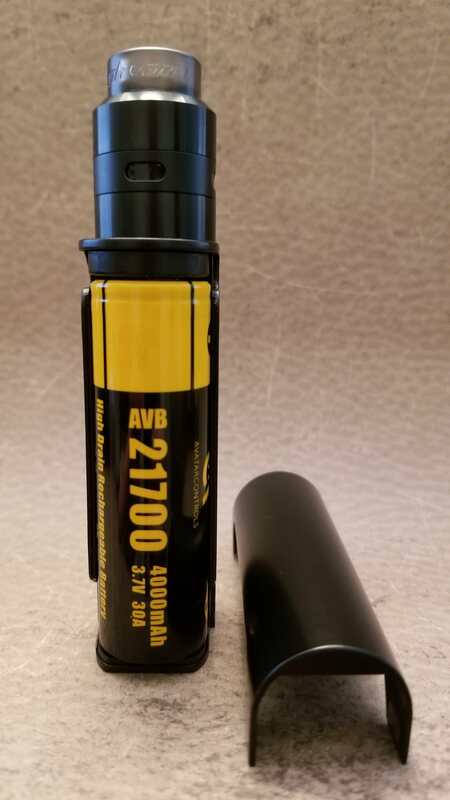 It also includes 2 amp charging with passthrough which is great for a mod on the go. I am sitting here thinking…hmmmm, what am I going to say about this tank. There is nothing wrong with it, works fine and is Smok Baby Beast coil compatible. 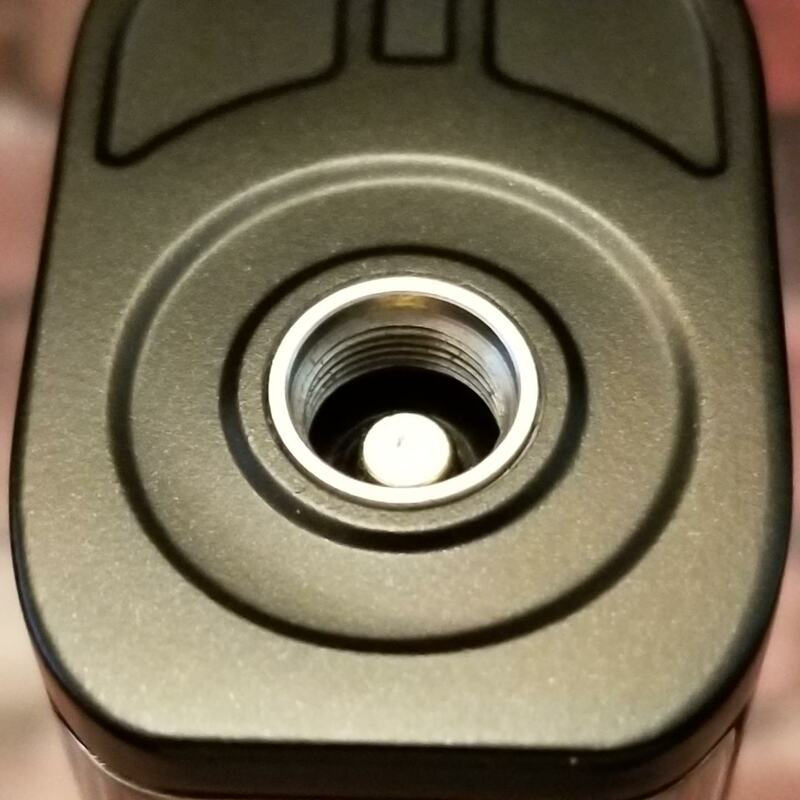 Comes with extra o’rings and what nots as well as a spare glass and (2) 810 TFV style drip tips, not friction fit 810 compatible. The first drip tip is my favorite shown above and the other is below. Comes with 2 coils, both the same ProCA 0.40 ohm coil which performed well, gave good flavor and had good life. The coils in my sample are marked 40 to 80 watts but I just noticed on there site they changed that to 55 to 65 watts. Good move on there part but even 65 watts can be a little too high, I liked it best at the lower 50 to 55 tops. It is not a bad tank, I didn’t mind using it but it never struck me as a great tank. I have at least 3 other tanks that use baby beast compatible coils I would rather use instead. 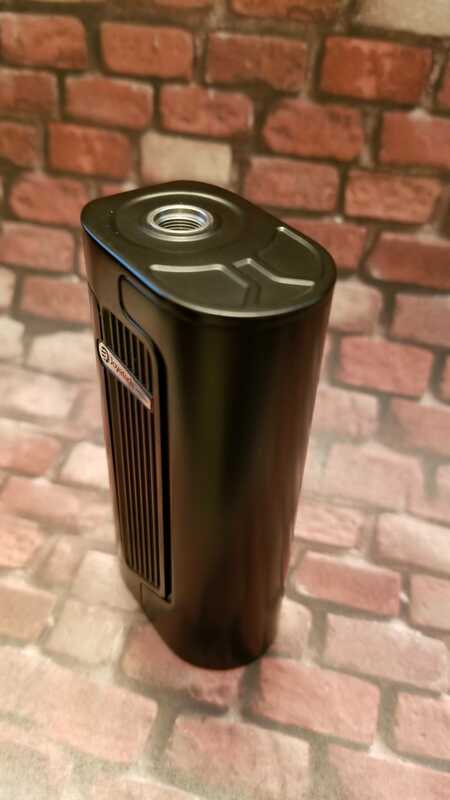 The ProCore Air just didn’t wow me in any way, both in performance and looks. 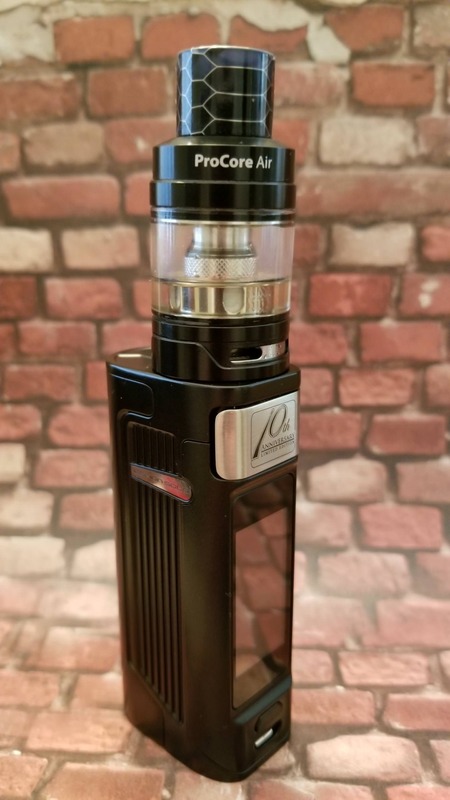 The Espion Solo is a mod that reminds me of the eVic VTC Mini, just with better battery life and nicer looks. I liked the VTC mini in power mode and gave out 2 of them to friends to help them quit smoking. I would have no problem recommending the Espion Solo to anyone looking for a compact mod for power only use. TC users need not apply as it lacks consistency to warrant a recommendation. Maybe Arctic Fox will issue a firmware update in the future, that should be a definite improvement but if your serious about TC there are much better options. I will keep it as mod to take if I need something small to fit in my pocket. Battery life is what makes it convenient for me and no problems using as a power only mod. The ProCore Air…ehhh, if you get it in the kit and it only costs $10 more than just the Espion Solo by itself then it is a serviceable tank. 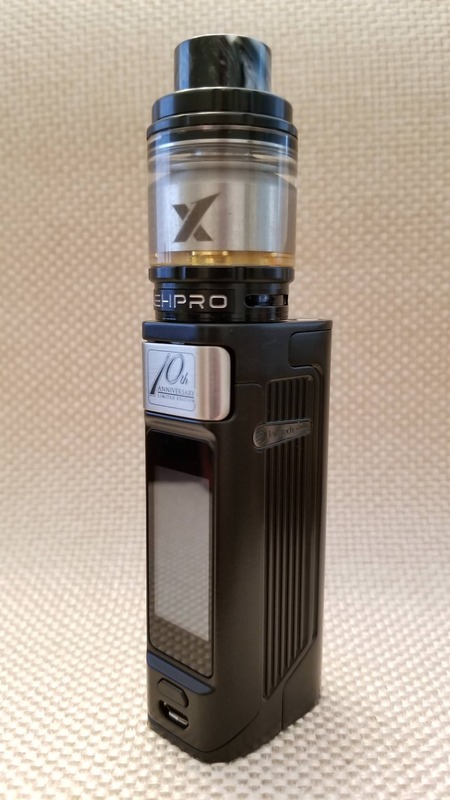 Anymore than that then just buy the Espion Solo and a different tank, there are better options out there.